Comparison of labor statistics over time is far too complex a subject to tackle here, but some points can be made. Manual or unskilled laborers were those who dug ditches, worked on farms, and took on any work that didn’t require training. Skilled labor was everything else: a mule spinner in a textile factory, a carpenter, shoemaker, police officer, engineer, printer, these were all skilled workers. 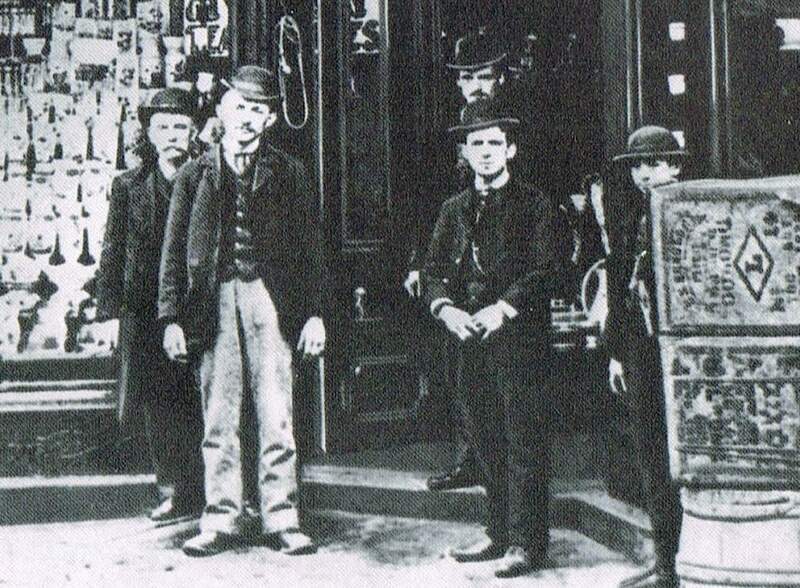 Tailors, the most common occupation among German New Yorkers, earned about $2.26 for a day’s work in 1874. 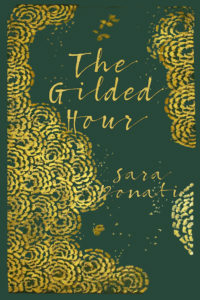 But their wages continued to drop as the depression wore on, so that the family wage of some tailors had dropped to $8-$9 for a six-day, 60 hour week by the early 1880s. Shoemakers, the second most common occupation in Little Germany, earned about $2.36 a day in 1874, but their wages also dropped over the decade. Some of the best paid members of the working class were probably the foreman working for the parks department. 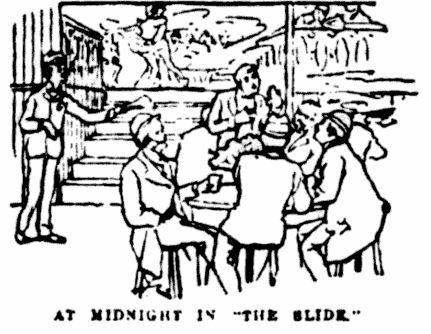 They earned about $4.50 for an eight-hour day, short for the time. Skilled workers in the building trades also received higher-than-average working-class wages. Employment was precarious for most of the nineteenth century and there was no publicly sponsored unemployment compensation to fall back on. Tailors, masons, and unskilled laborers usually could only count on about five to seven months of work. The winter shut down most of the building trades from November to March. Garment production was slack between June and September, and again from December to April. Families could supplement their income by taking in boarders, or the women and children could take in homework. A boarder could bring in $3-$4 additional income a week with relatively little extra effort or expense. 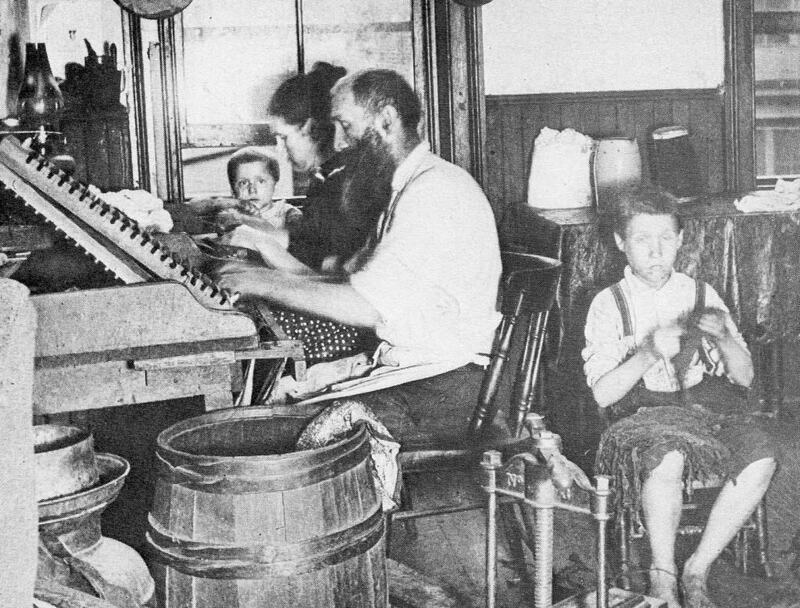 Many families worked together at home making everything from cigarettes to condoms. (Wikipedia) The Knights of Labor (K of L), officially Noble and Holy Order of the Knights of Labor, was the largest and one of the most important American labor organizations of the 1880s. …. The Knights promoted the social and cultural uplift of the workingman, rejected socialism and anarchism, demanded the eight-hour day, and promoted the producers ethic of republicanism. In some cases it acted as a labor union, negotiating with employers, but it was never well organized, and after a rapid expansion in the mid-1880s, it suddenly lost its new members and became a small operation again. It was established in 1869, reached 28,000 members in 1880, then jumped to 100,000 in 1884. 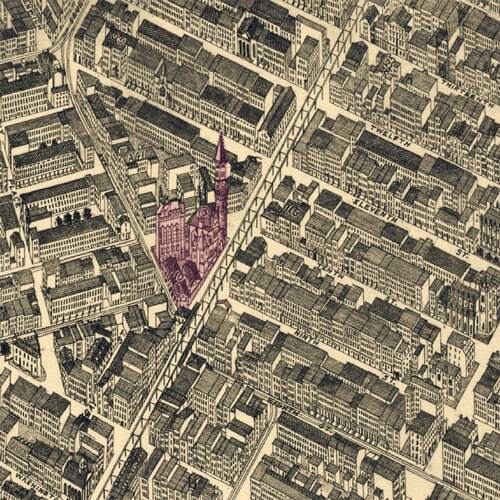 By 1886 20% of all workers were affiliated with the KOL, ballooning to nearly 800,000 members. Its frail organizational structure could not cope as it was battered by charges of failure and violence and calumnies of the association with the Haymarket Square riot. Most members abandoned the movement in 1886-87, leaving at most 100,000 in 1890. Reliable information about fortunes and holdings of the wealthiest in the city is difficult to come by. This excerpt from Godey’s Lady’s Book (July 1884) doesn’t provide any sources, and should be taken as conjecture. The inset summaries are via Wikipedia unless otherwise indicated. Stewart had extraordinary skill in business, and by 1848 he had built a large marble-fronted store on Broadway between Chambers Street and Reade Street, which was devoted to the wholesale branch of his business, and the largest retail store in the world at that time. Stewart also had branches of his company in different parts of the world and owned several mills and factories. Stewart had an annual income of $1,843,637 in 1863. His business success is estimated to have made him one of the twenty wealthiest people in history, with a fortune of approximately US$90 billion in 2012 prices. Stevens died in Paris, France in 1868. His will left the bulk of his fortune to his wife and children, but also donated land adjoining the Stevens family estate, as well as $150,000 for the erection of a building and $500,000 as an endowment for the establishment of an “institution of learning”. Because of the Stevens family’s close ties with engineering, the will’s executors decided it would be an institution devoted to the “mechanical arts”. This institution became Stevens Institute of Technology, which opened its doors in 1870. Moses Taylor (January 11, 1806 – May 23, 1882) was a 19th-century New York merchant and banker and one of the wealthiest men of that century. At his death, his estate was reported to be worth $70 million, or about $1.7 billion in today’s (2015) dollars. He controlled the National City Bank of New York (later to become Citibank), the Delaware, Lackawanna & Western railroad, the Moses Taylor & Co. import business, and he held numerous other investments in railroads and industry. These ladies all are widows. Miss Catherine Wolfe, worth $2,000,000, is the richest spinster. Mulberry Bend, ca 1890. Click for larger size. 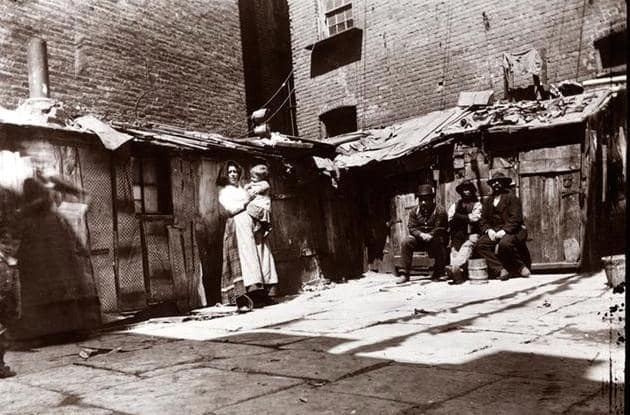 The government of the city knew about the connection between poor health and poverty, and they knew too that the biggest part of the problem was the unsanitary conditions in tenement districts where almost all newly arrived immigrants found themselves. As is still the case, slum landlords were adept at evading the law, and the city government was complicit. Miss Helen Potter telling of the needs of the tenement-house occupants. The Sanitary Map and Social Chart of the Fourth Ward of the City of New York was published in 1866 along with a detailed report on living conditions. 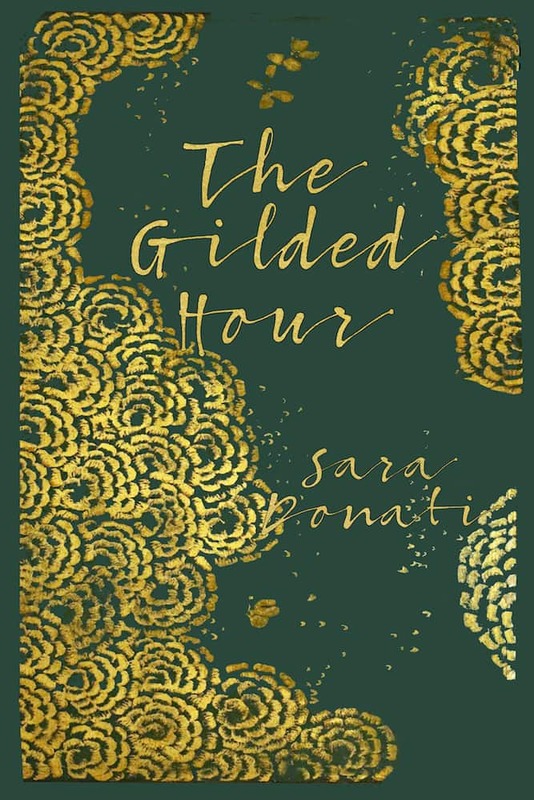 It is, of course, twenty years earlier than the events in The Gilded Hour, but the amount and quality of information is excellent and relevant. Report of the 4th Sanitary Inspection District made to the Council of Hygiene of the Citizen’s Association by E.R. Pulling, M.D., assisted by F. J. Randall. Report of the Council of Hygiene and Public Health of the Citizens’ Association of the New York Upon the Sanitary Condition of the City, second edition. 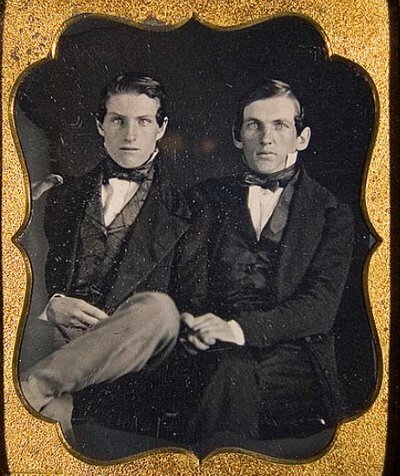 New York: D. Appleton & Co., 1866. The diagram on the opposite page represents an area eighty yards long and fifty yards wide, including the cul-de-sac at the termination of Cliff Street. It illustrates the proximity to crowded habitations of offensive and dangerous nuisances, often observed in the lower part of the city. The diagram presents an accurate ground plan of each tenant-house which it embraces. Within this space are 20 dwellings occupied by 111 families, and having a population of 538 persons. A soap-and-candle factory, a tannery, and five stables, in which are kept not less than 30 horses, are also wholly or partially included within its limits. A, B, C, D, E, are tenant-houses fronting on Vandewater Street. An alley four feet wide running through C forms the sole communication with the five tenant-houses F, G, H, I, J, which open into the small court R, in which stands their common privy, f, situated within three feet of the hall door of one of the houses, which is constantly pervaded by its noisome odor; c, d, e are privies situated immediately under the windows of houses F, G, H; a, b are privies belonging to the tenant-houses A and B; K, L,M, N, are tenant-houses standing back to back with two of those in the court above mentioned and with three stables to which access is had from Vandewater Street. 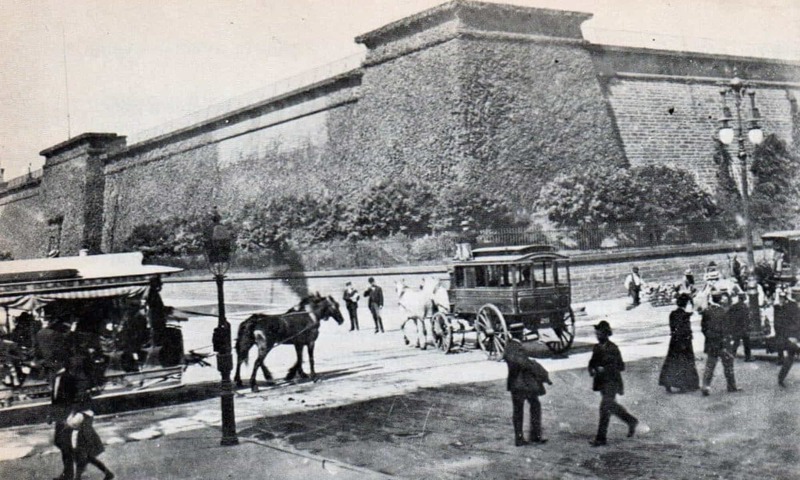 The position of two stables fronting on Cliff Street will also be observed. The soap-and-candle factory, whose frontage is shown in the cut, is a very extensive one, and its emanations vitiate the atmosphere for a considerable space around. T, T, T, represent a series of tan vats, in the rear of a leather factory on Frankfort Street, which generally contain a large number of green hides in a very offensive condition. The peculiar stench from this source is usually quite perceptible through the entire area shown in the engraving. Insalubrious: Unhealthful, not providing or promoting health. This locality lies on the borders of a former marsh known as “Beekman’s Swamp.” The appearance of every inhabitant of this region indicates a low and vitiated condition of the system, rendering it specially susceptible to adynamic forms of fever, which, during epidemic visitations, have on several occasions spread with terrific rapidity through the entire quarter. 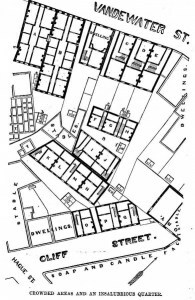 Typhus fever has prevailed during the past year to a considerable extent in some of these houses, while small-pox has been rife in the tenant-houses on Vandewater Street. It has been observed that scarlatina is especially malignant and fatal here. In these reports neighborhoods that were sanitation disasters were labeled ‘insalubrious districts’. The report was written more than twenty years before the opening of the Brooklyn Bridge, but the worst neighborhoods remained exactly as they had been. 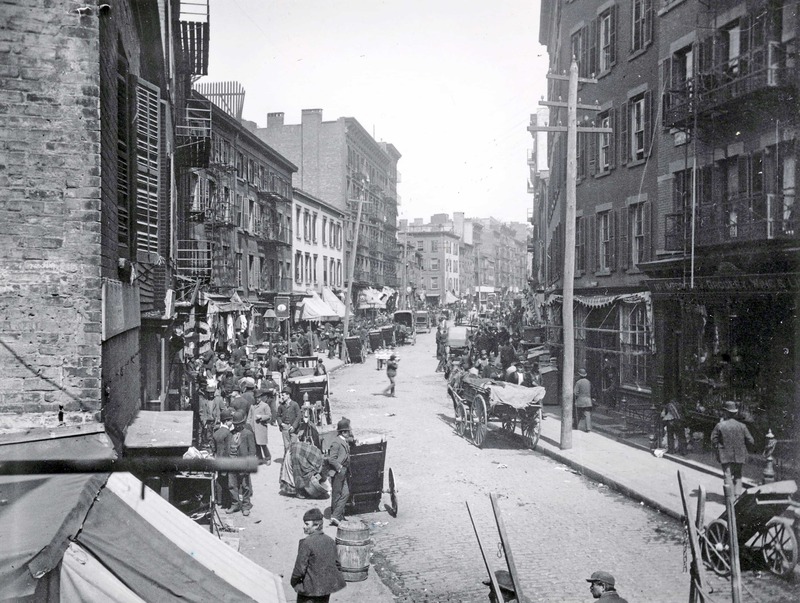 Recent immigrants were the most likely residents in these tenements.